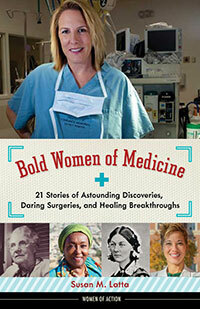 Bold Women of Medicine tells the stories of twenty-one courageous women from the 1800s to the present focused on finding cures, tending the sick and wounded, and healing with science and compassion. With grace and bravery they broke down barriers to enter battlefields and operating rooms. Readers meet groundbreakers such as Elizabeth Blackwell, the first woman to receive a medical degree in the United States, who went from the sole female student in her medical school to eventually founding her own hospital, staffed by all women; Mary Carson Breckinridge, the “nurse on horseback” who delivered babies in the Appalachian Mountains, believing that everyone, even the poor and uneducated, deserved good healthcare; and heart surgeon Kathy Magliato, one of the few women trained in heart transplant surgeries. Packed with photos, informative sidebars, and including source notes and a bibliography, Bold Women of Medicine is an invaluable addition to any student’s or aspiring doctor or nurse’s bookshelf. I have always been a believer in those who fight insurmountable odds. My favorite song as a child was “I Have Confidence” from The Sound of Music. I used to (and still do sometimes), sing it to buck up before a big event. It works, you should try it some time. The women of medicine knew they were up against the odds. Deep down they had confidence but it was severely challenged when they were jeered, hissed at, or barred from their studies. They carried on and fought for their ideas, their patients, and their love of science and medicine.